Activists and computer programmers demonstrated Wednesday what they said were flaws with electronic voting machines that could allow hackers to change vote outcomes Nov. 2. They recommended new procedures for states and counties to put in place before Election Day. Voting machine manufacturers, however, denied their devices could be tampered with and dismissed the demonstration as scare tactics. The head of the U.S. Election Assistance Commission said at least some of the proposed changes were unrealistic. Bev Harris, an outspoken critic of electronic voting and author of "Black Box Voting: Ballot Tampering in the 21st Century," led the National Press Club demonstration that included a film of a chimpanzee hacking an election. Using a laptop computer, she demonstrated what she said were easy hacks to software by Ohio-based Diebold Inc., which is used in central tabulators that will count votes Nov. 2 in some 1,000 counties. Harris contended that hackers could easily change vote totals by entering the database through a backdoor method. She also claimed hackers could enter the standard way after obtaining passwords, then manipulate vote totals and cover their tracks. "It's astonishingly easy to get in," she said. "There's no security whatsoever." Programmer Jeremiah Akin, of Riverside, Calif., showed what he said was a flaw in software by Oakland, Calif.-based Sequoia Voting Systems Inc., that would allow a hacker to switch votes by people voting in Spanish or another foreign language. Spokesmen for Diebold and Sequoia strongly denied the claims. "What you witnessed was a staged event to convey something that isn't possible," said Diebold spokesman David Bear. "The fact of the matter is touchscreens have been around for many, many years, they've conducted hundreds of elections, and there's never been a single factual problem with touchscreens." "It's so amazing to see people use fear tactics this close to a major election on issues that are so remote and unlikely," said Sequoia spokesman Alfie Charles. "They still haven't explained to people how these attackers would be able to walk into a county voting system, get the password and start reprogramming elections." Last November, computer voting machines in Boone County, Ind. — not manufactured by Diebold or Sequoia — somehow recorded 144,000 votes cast in a country where only 19,000 registered voters live. When corrected, it turned out a mere 5,352 ballots had actually been cast. In a Fairfax County, Va. election the same month, at least one voting machine produced by yet another company was reported to have subtracted votes from a school board candidate, rather than adding them. 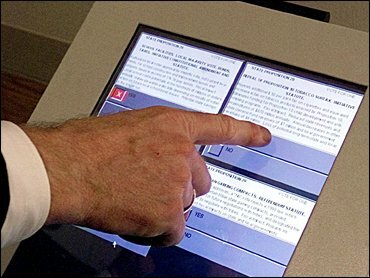 Up to 50 million voters will use touchscreen machines in November; even more will have their votes tabulated electronically by central vote tabulators. Harris offered several suggestions for eliminating potential problems with electronic systems. Harris said that poll workers should print out vote totals on the precinct level. Those could then be checked against the county total. She also recommended that jurisdictions with touchscreen machines allow voters to vote by absentee ballot on Election Day, and that precincts not relay vote totals to counties via modems, which could be vulnerable to hackers. DeForest B. Soaries, chairman of the new U.S. Election Assistance Commission, said there will be improvements Nov. 2 over past elections, including election administrators working harder to keep track of who has access to voting equipment. Last year, eyebrows raised when Diebold chairman Walden O'Dell — who has donated more than $8,000 to Republican causes since 1997 — wrote in a GOP fund-raising letter, "I am committed to helping Ohio deliver its electoral votes to the president next year."